This is one of those meals that we’ve made since the early days of our marriage. Just five weeks after we were wed, Randy and I moved from Utah down to Houston, Texas. It was a whirlwind first year. New marriage, new state, new home, new job, continuing education online for Randy, and a brand new baby on the way (somewhat planned just three months after we said “I Do!”)! Did I mention that I got married 23 days after I turned 19?! Yeah, it was nuts. The company where we both worked didn’t offer health insurance, instead giving us a little extra each month to help buffer any expenses that may arise. This would have been fine normally, since we are generally healthy people, but when we found out I was pregnant we went from poor newlyweds to practically destitute newlyweds. Still some of the best memories of our new life together. Scraping together every penny we could, we scrimped and saved in all conceivable areas, with” grocery” being the tightest budget. We consumed a lot of PB & J sandwiches, pancakes, salads, and Tuna Noodle Casserole. Throughout the years, this has been a staple meal for our family. I didn’t realize how much it was loved until a few years ago, when Caden and I spent months living in the Ronald McDonald House in Seattle while he was going through cancer treatment. Because space was limited in the shared kitchen areas, we didn’t tend to keep many ingredients on hand. Planning our meals almost daily, one of the recurring meals we always had ingredients for was this casserole. Truly, this meal brought my son comfort while he was away from home. The epitome of comfort food. Furthermore, finding joy while living away from home is not always easy, but this meal brought a giggle to my severely ill child once. “Hey, Mom, remember that one time you made this without tuna?” And we laughed and laughed. After years of making this, it was almost like second nature to just grab the ingredients and go. I was in a hurry and simply forgot the main ingredient. After the first few bites, Randy commented that it didn’t taste the same. And it hit me like a ton of bricks: I forgot the tuna! We laughed back then, Caden and I laughed at the Ronald McDonald house, we still laugh today. I love that a meal this simple holds so many treasured memories for us, made even more special now that my Caden is gone. Food has that power sometimes. The sight, the scent, the taste, the feeling, the memories– it’s like magic the way they make you feel right at home, no matter where you are. In a large pot on your stovetop, bring 5 qt. water to a rapid boil. To add flavor and reduce stickiness, add 1 Tbsp. salt to the water. Add 12 oz. egg noodle pasta and stir, return to rapid boil. Cook, uncovered, for 7 minutes. Drain well. While you are waiting for the water to boil, and also for the pasta to cook, combine all other casserole ingredients in a large mixing bowl. Set aside, until the pasta is cooked and drained. 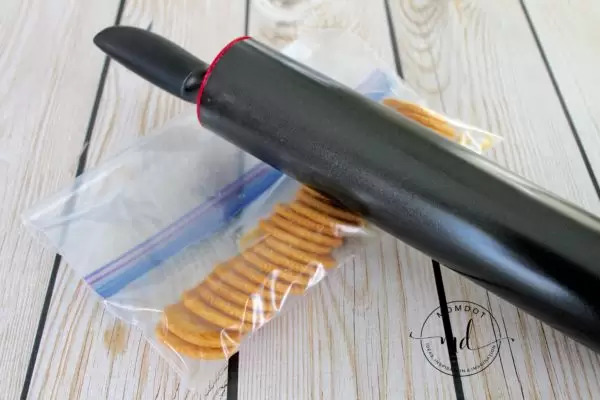 Once you’ve combined all the ingredients for your casserole, place your crackers into a sealed bag and crush with a rolling pin; you’ll want it fine. Melt your butter and mix into your crushed crackers. 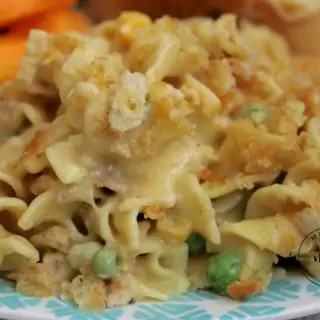 With the pasta cooked and drained, and the other ingredients combined, go ahead and mix the noodles into the mixture and spread in the bottom of a greased 9×13 baking dish. Crumble your cracker mixture over the top. Bake for approximately 30-45 minutes. You’re just heating this through, since all ingredients are already ready for consumption. I usually place a thermometer in the center to alert me when the temperature reaches 165 degrees. 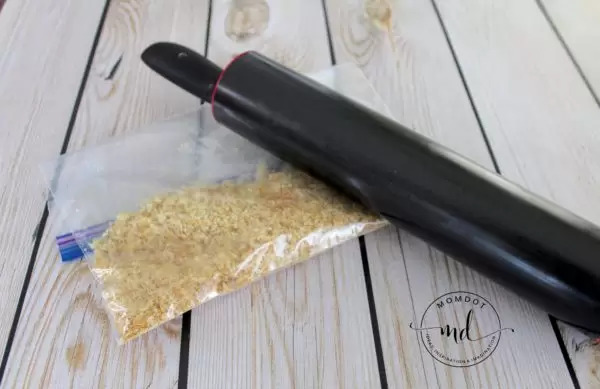 Once you've combined all the ingredients for your casserole, place your crackers into a sealed bag and crush with a rolling pin; you'll want it fine. Melt your butter and mix into your crushed crackers. 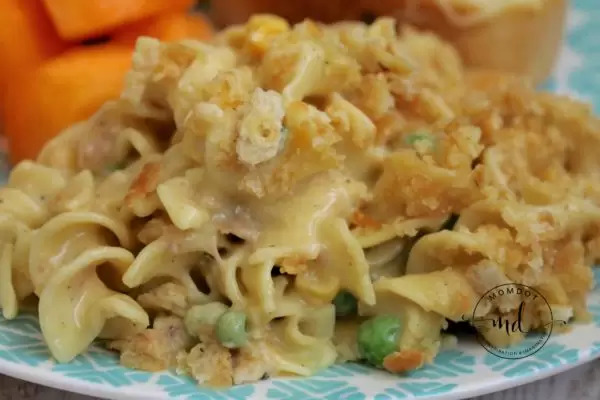 With the pasta cooked and drained, and the other ingredients combined, go ahead and mix the noodles into the mixture and spread in the bottom of a greased 9x13 baking dish. Crumble your cracker mixture over the top. Bake for approximately 30-45 minutes. You're just heating this through, since all ingredients are already ready for consumption. I usually place a thermometer in the center to alert me when the temperature reaches 165 degrees.